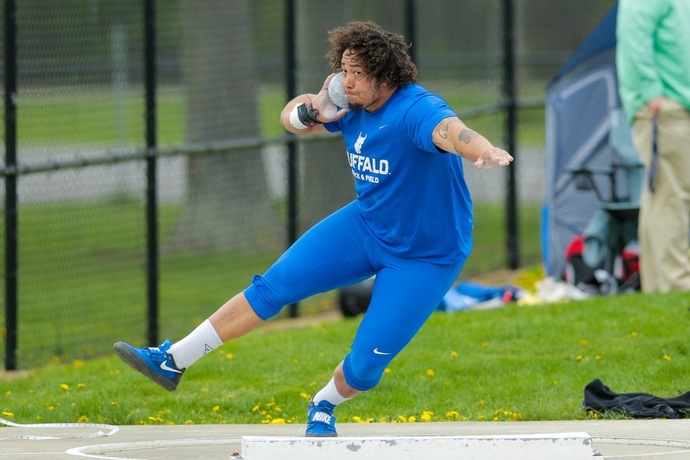 BUFFALO, N.Y. -- The University at Buffalo hosted the third annual Garnham Throws Challenge on Sunday afternoon. The event gives recognition to UB throw coach Jim Garnham, who is one of the most decorated throwing coaches in the NCAA. The event gives throwers the opportunity to compete in the fall season for what traditionally is a spring sport. It included the shot put, discus, hammer and javelin events. The age groups ranged from 19 & under, 20-39, 40-49, 50-59, 60-69, 70-79, and 80+. Buffalo sophomore Sam Wray impressed on the day as he took home first place in two events, the men's hammer throw with a throw of 49.65m and the discus throw with a heave of 47.90m while competing in the men's NCAA 20-39 age group. UB sophomore Brianna McKenzie also had a strong showing, winning one event and placing second in the other. McKenzie won the hammer throw event with a throw of 43.62m and placed second in the discus with a throw of 35.76m while competing in the under 19 age group. Also making an appearance for the Bulls on the afternoon was freshman Asia Hoyte who took home second in the under 19 women's shot put event, throwing the ball 11.73m. Click here for full results from the event.